Welcome to the home of Josenhans Fly Fishing, a year-round fly fishing and light tackle guide service on the beautiful waters of the Chesapeake Bay. Captain Kevin Josenhans will be your guide and host. Kevin offers custom guided fishing trips from the Susquehanna Flats to the Chesapeake Bay Bridge Tunnel. Throughout the seasons, he will show you the best fishing the Chesapeake has to offer. While Kevin will travel and fish the entire Chesapeake Bay, he is perhaps best known for his expertise on fishing the fertile flats of Tangier Sound. Located on Maryland's historic Eastern Shore, it is here you will enjoy flats fishing for striped bass, speckled trout, bluefish, redfish, flounder and more. Tangier Sound has often been refered to as a "hidden jewel" of the Chesapeake. Lush underwater grasses cover miles of saltwater flats, interspersed with dozens of unspoiled marsh islands and tidal creeks. Shorebirds and waterfowl are abundant. Captain Kevin Josenhans has been guiding satisfied anglers since 1993, and he continually strives to maintain his reputation as one of the Chesapeake's premier guides. 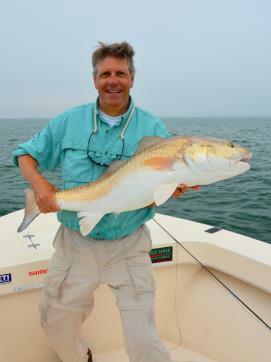 His goal is to provide a relaxed, enjoyable, fish-catching trip that will leave you longing for more. Captain Kevin Josenhans has been featured on ESPN's Fly Fishing America and Outdoor Life Network's Fly Fishing the Tidewaters. Come join him for a fishing adventure all your own.